On a large and sprawling campus like JPL, signage is key to directing visitors from point A to point B. Hungry for lunch? Follow the signs to the Orbit Cafe. Interested in something a little more galactic? There’s a sign for that, too. 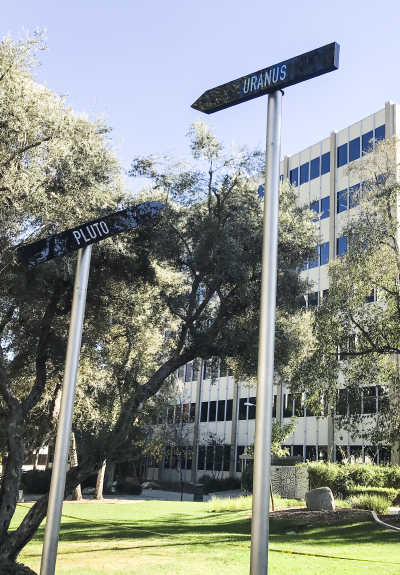 Since December 2017, Line of Sight, a permanent art installation featuring three rotating signs erected on the JPL Mall, has oriented passersby to the destinations of distant space missions, such as Uranus, Pluto, and Neptune. Lois Kim, the JPL visual strategist who created the concept for Line of Sight, worked with a team of engineers and data coders to translate her idea into reality. She says JPL employees are excited to see their missions on the sign and she has added a few new ones at their request. For visitors, Kim hopes the signs will give a sense of the vast scope of the Lab’s mission and work.